Dinner will be served starting at 6:00 pm, and the Council will open for business at 7:30 pm. 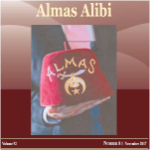 All though Almas Shriners is located in the Nation's Capital our membership extends around the world. Due to the nature of our city, with people coming from all over the world to work here and natives of Washington, DC moving to other countries, we literally have members throughout the world.